John's original prefab bathroom, complete with heated towel rail! For the last year, Jane and I have been passing John’s very well preserved prefab on Drakefell Road once a month while taking enthusiasts on a Brockley-Nunhead prefab tour. Although we did spend a certain amount of time admiring John’s prefab from the outside – sometimes even giving sneaky looks through the garden gate … -, we never found the time to properly go and knock on John’s door. 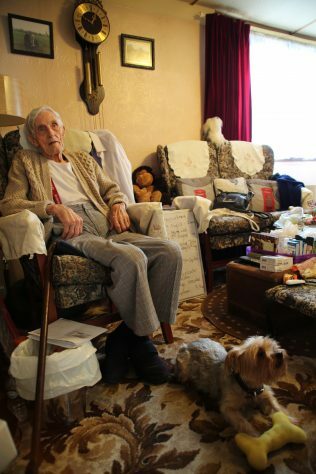 A few weeks ago, Jane finally met him and had a wonderful time with him, talking about his prefab memories, Deptford where he was originally from and all sorts of things. John invited Jane to come back and I couldn’t resist to come along. We were welcomed by the energetic barking of John’s little dog Elly, followed by John, a very elegant 92 years old English man who offered us tea, biscuits, sweets and cakes! We instantly felt cosy and home at John’s cherished uni-seco. Only Elly was obviously jealous by so much attention drawn at us. It was almost like she exactly knew when to bark to ruin the interview. After many stratagems, we managed to keep Elly outside, in the prefab’s garden, where she had all the space to bark and calm down from her jealousy crisis. 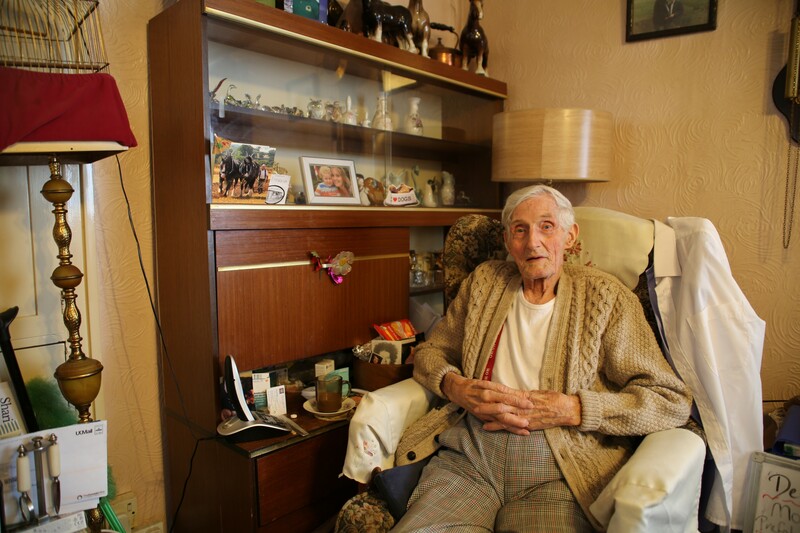 Then, John started to talk, he told us how he got his prefab in 1948 – which probably makes him one of the oldest prefab dwellers in the UK -, after he came back from the war and had lost his wife. Born of a family of 14 children in Deptford near to the Palace Cinema in Hyde Street, he told us funny childhood memories and talked about his passion for horses and many other things we filmed and recorded… till he got worried about Elly escaping! “She’s done it before!”, he told us. I had to let her back in. 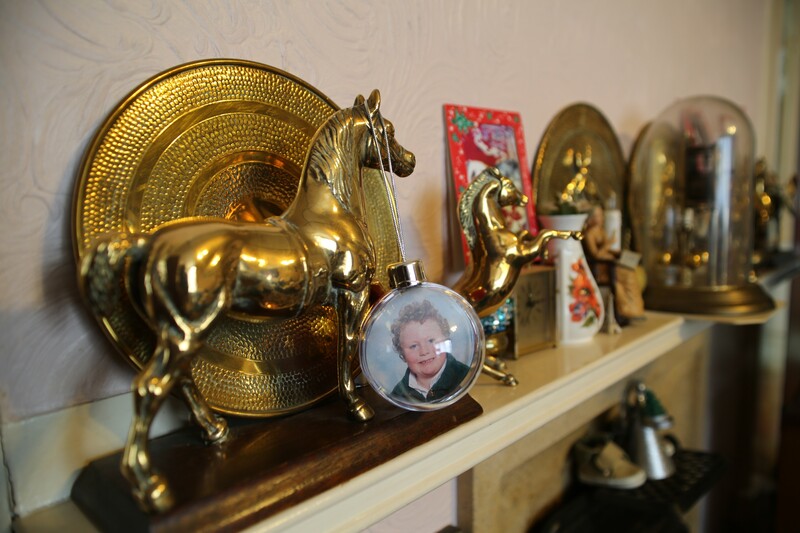 She quickly took over John’s prefab which is packed with knick-knacks, furniture, photos, memories and sweets living-room. Of course, she hated us even more than when we arrived! Luckily John’s granddaughter and her son arrived, and kept Elly in the kitchen while she prepared John’s lunch and… Elly’s! 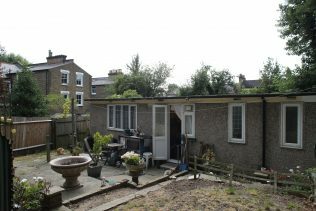 There is still one prefab lived in, in Lordship Lane. Did anyone live in Etherow street. I lived in number 13? As a very young child I lived in a Nissan hut in New Cross ( possibly the top of Jerningham Road ? ) 1951 ? I have never found any information other than a corner of the construction showing in a photograph of myself and my mum . . Anyone have any information of this site ? I am not sure if this is the correct place to write but I hope so. My family moved into prefabs at KIDBROOKE WAY BUNGALOWS . in London se3. I was 5 and my sister was born there in 1947. I can find no record of them anywhere. They were directly behind the Dover Patrol pub. Let me know if you would like more info. Now live in San Diego, California. We did have a link to photos of prefabs on Pensbury Street on our map. It was from the London Metropolitan Archives, who are in the process of putting their archives online. This link is now broken. You could check the Collage website (their photo archive) searching for ‘mobile homes’ to see if it has been included. Many thanks for contacting us. In the 1970’s I lived in a prefab in pens bury place London sw8 I have been trying to find pictures of them. But not been sucsessful .it was one of my happiest times. Of my life. I would love to see them again.i lived there with a very close friend .he.s now past away. And a X partner she as all so past away.. Could the be away I could see pictures . On the Internet . Thank you. Thank you for sharing your wonderful memories with us! Hello. Im glad you have the Hindmans Road prefabs marked on your map. They were on a huge site and were opposite us and in both Darrell Road and Crystal Palace Road. Our sode were tge last ones to be demolshed. I made camps in them as a kid when they became vacant and before they were demolished. 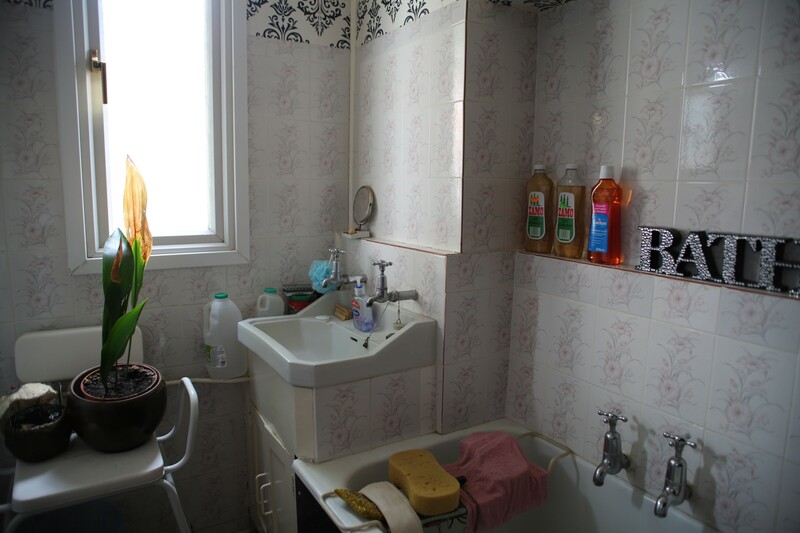 We were rehoused into 246 Underhill Road, a newly refurbished 3 bed house. But both our neighbour and us cried and cried leaving the prefab and hated the house. Anyway we are still friends with our prefab neighbour who lived and spent most of her childhood and adult life in 105 Hindmans Road and I have booked 4 tickets for the event on friday 23.09.2016 in East London. We will bring some pictures for your archive. We all loved our prefabs so much and we are all excited about your museum. BTW. My nan was in her sisters dairy in Hindmans Road during the war when their was a direct hit that demolished the houses that led to the prefabs in Hindmans Road being built. My nan and great aunt survived. Thank you Mark for sharing your lovely memories of the Hindmans Road prefabs with us! We have them marked on our map so it’s great to bring them to life. 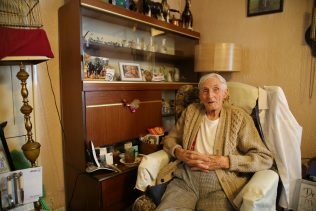 Its great to see and read people still living in their prefabs. I spent about 9 happy years in one as a child, it seems a lot longer. We moved in the 1970s and were the last residents in 107 Hindmans Road, East Dulwich before it was demolished in the mid 1980s. My mum fought hard for us to be allocated it from the council as we lived in a 2 bed flat on the Dog Kennell Hill estate. My Mum wanted to be back close to her parents in 138 Landells Road. She actually first went after prefab no 99 Hindmands Road first and was very disappointed to see it had been let. But with her perserverance she finally was allocated 107. It was a row of 9 prefabs, we were the end terrace. Their had been no 109 but had been demolshished some years previous. We lived next door to a wood yard. Most of those in our row had lived in them from the beginning and we joined a lovely little community. I always felt like i had a country up bringing as there was always loads of animals around and our neighbour worked for the parks so she was always rescuing ducks, squirrels that had been injured. I was looking after a dear little duck quackers for a week because she was really getting Jill down because she was so demanding and noisey and a neighbour was complaining. I filled our bath up so she could have a bit of a swim when a man from the council came to do some repairs. I didnt think about quackers in the bath until he stuck his head round the door and said ‘you know you have a duck in your bath’. That just sums up some of my lovely childhood memories of growing up in our prefab.